OTTAWA, Ontario (CNS) — Pro-life advocates are making plans to address a new law in Ontario that will create “bubble zones” around abortion facilities and likely force the National March for Life in Ottawa to find a new route. The new law, which takes effect Feb. 1, establishes a 50-meter, no-protest zone around eight abortion facilities in Ontario and a 15-meter zone around the homes of doctors and others involved in providing abortion services. Beginning in February, hospitals and pharmacies also can apply to have so-called bubble zones implemented around their premises. The new law makes it an offense inside a restricted zone to show any type of disapproval “concerning issues related to abortion services, by any means, including oral, written or graphic means.” First-time offenders face fines of up to $5,000 and six months in jail. 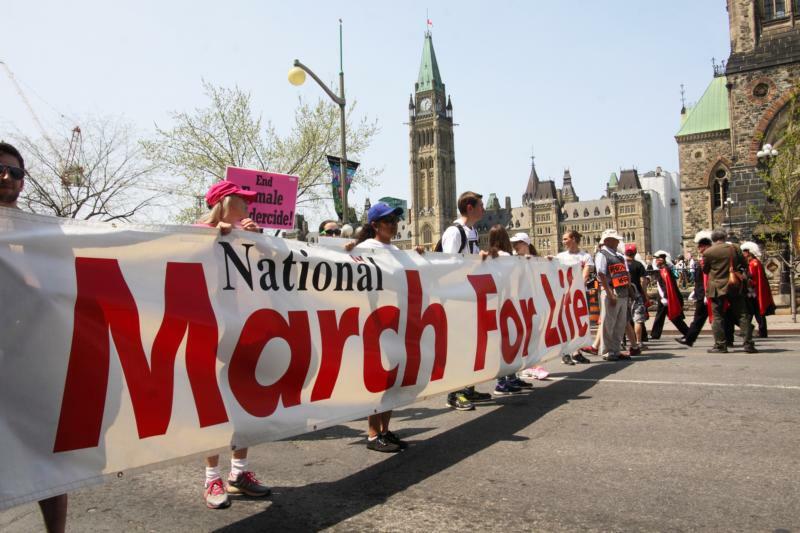 The National March for Life, which attracts more than 20,000 pro-life advocates each May, has traditionally passed in front of the Morgentaler abortion facility in downtown Ottawa. The new law likely will force organizers to find a new route because it will be illegal for people to carry a pro-life sign or speak against abortion within 50 meters of any abortion clinic. Ottawa Police Sgt. Martin Groulx of the special events team said, as he understands it, something as simple as entering a bubble zone while wearing a pro-life T-shirt or cap would be a violation. Groulx has been in contact with organizers of the march and will meet with them after police receive guidelines on how they are expected to enforce the new law. He anticipates an educational period, but those who have been warned can expect the police to enforce the new law, he said. March organizers say they have “an excellent and long-standing relationship,” with Groulx. Finding a suitable route for the March would become even more difficult under the new law if many of the dozens of pharmacies in Ottawa successfully apply to create bubble zones around their premises. Chris Murawsky, manager of the Ottawa office of Campaign Life Coalition that organizers the March, plans to meet with police after the law takes effect Feb. 1, before he applies the following month for the permit to hold the march. Campaign Life may challenge the bubble-zone legislation in court on the basis that it violates free speech. “We are in ongoing discussions with our lawyers,” said Matt Wojciechowski at Campaign Life Coalition headquarters in Toronto. The bubble-zone legislation was prompted by news reports in Ottawa of individuals “wearing sandwich boards” who harassed and spit at women as they entered the Morgentaler clinic. However, Cyril Winter is the only protester who wears a sandwich board, and he claims he is the one who has been spit at. The retired tradesman said he has never spit at or harassed a woman entering the clinic. Wanda Hartlin, coordinator of the annual 40 Days for Life campaign that began in Ottawa in 2008, said organizers discussed in November whether to hold the prayer vigil near the Human Rights Monument or on Parliament Hill instead of across the street from the Morgentaler facility. Groulx said the law does not prevent people from praying inside a bubble zone provided they do so in a way that does not publicly demonstrate opposition to abortion.